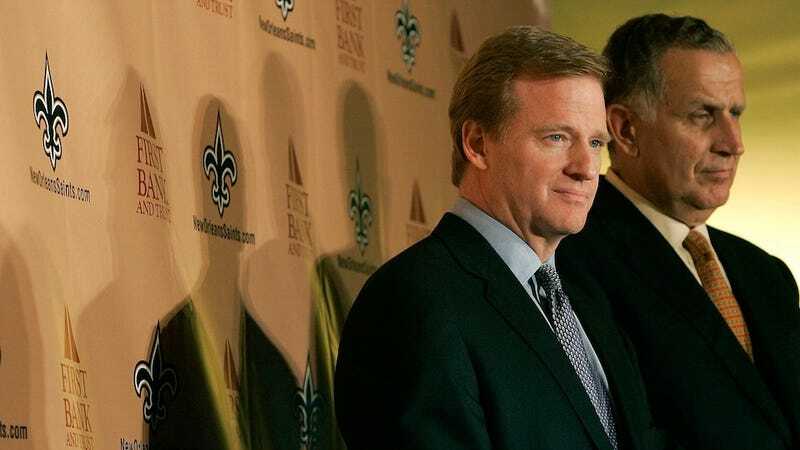 When Roger Goodell appointed Paul Tagliabue to hear the Saints' bounty appeal, the players fought to get the ex-NFL commissioner to recuse himself. There was no way, they thought, that Tagliabue would kneecap his successor, invalidating the suspensions that Goodell had pronounced from his unassailable lair atop Commissioner Mountain. But on Tuesday, Tagliabue sided, amazingly, against the man sitting behind his old desk, vacating the suspensions of four current and former Saints. Though he affirmed many of Goodell's original findings of player misconduct, this is the equivalent of a teacher writing "nice job" in the margin of a D paper. Goodell got it wrong in every way that matters. He conducted an unfair investigation that reached bad conclusions based on faulty evidence, then crowed sanctimoniously about his findings. Now, at last, this story has the ending it deserves, with the power-hungry commissioner undone by his quest to demonstrate just how powerful he can be. Viewed narrowly, Tagliabue's ruling absolves Jonathan Vilma, Will Smith, Scott Fujita, and Anthony Hargrove because NFL players follow orders or get cut. "Coaching legends such as George Halas and Vince Lombardi are not glorified or remembered because they offered players 'freedom of choice,' " Tagliabue writes. In the case of the Saints, it was coaches like Gregg Williams who "conceived, encouraged and directed the program," destroyed evidence off of team computers, and told players to lie about it to NFL investigators. The players, by virtue of their being employees rather than employers, should not be punished for doing what they're told to do. Tagliabue's write-up reveals, carefully and methodically, that Goodell ignored league precedent during the bounty probe. Rather, he used the investigation as a vehicle to talk tough on gridiron crime and present player safety as an issue of profound concern to the league, imperiled only by the players themselves. Nine months ago, the commissioner wrote that he was "profoundly troubled by the fact that players … embraced this [bounty] program so enthusiastically" and that "while all club personnel are expected to play to win, they must not let the quest for victory so cloud their judgment that they willingly and willfully target their opponents and engage in unsafe and prohibited conduct intended to injure players." These passages, it turns out, offer a better sketch of the NFL boss than the behaviors he was tut-tutting. In parceling out punishments without regard to logic or history, it was Goodell, not the players, who acted over-enthusiastically. It was Goodell, not the players, whose judgment was clouded. For the second year in a row, Slate and Deadspin are teaming up for a season-long NFL roundtable. Check back here each week as a rotating cast of football watchers discusses the weekend's key plays, coaching decisions, and traumatic brain injuries. And click here to play the latest episode of Slate's sports podcast Hang Up and Listen. Consider the case of Scott Fujita. On May 2, the league announced that the former Saints and current Browns linebacker was suspended for three games because he "pledged a significant amount of money to the prohibited pay-for-performance/bounty pool during the 2009 NFL Playoffs. … The pool to which he pledged paid large cash rewards for 'cart-offs' and 'knockouts,' plays during which an opposing player was injured." Five months later, Goodell reduced Fujita's suspension to a single game, explaining that while "I have not found that you directly contributed to the bounty pool, there is no serious question that you were aware of the pool and its elements." Even as he walked back his initial claims, however, the commissioner mounted a smarm offensive. "I am surprised and disappointed by the fact that you, a former defensive captain and a passionate advocate for player safety, ignored such a program and permitted it to continue," Goodell wrote to Fujita. This has been the NFL's consistent line of attack: If the evidence turns out to be flimsy, wag your finger all the more vigorously. The league suspended Hargrove, NFL general counsel Jeff Pash explained in June, in part because footage of the 2009 NFC Championship Game showed the defensive lineman saying "give me my money." A month later, when it became clear it wasn't Hargrove's voice, Goodell claimed that the "identity of the player who made the statement … did not affect the level of discipline imposed on Mr. Hargrove." Tagliabue's ruling, by contrast, comes from an alternate NFL universe in which the flaws in the case actually matter, and the arbiter's self-calibrated disappointment level is not determinative of the outcome. Fujita's actions, as the ex-commissioner explains, were neither surprising nor disappointing. Now that the league has admitted there's no evidence the linebacker paid cash for "cart-offs," his behavior is no different than that of other players who reward their teammates off the books. Tagliabue points to similar cases involving the Packers and Patriots in 2007 and 2008 in which the teams, not players, were punished (with small fines, not suspensions) for pay-for-performance pools. "Accordingly, the NFL's decision to suspend a player here for participating in a program for which the League typically fines a club certainly raises significant issues regarding inconsistent treatment," Tagliabue writes, saying that Fujita's "actions here were not conduct detrimental." Tagliabue also implies that Goodell's self-righteousness trumped sanity with regard to Hargrove and Smith. The former was suspended eight games (later reduced to seven) for denying the existence of a bounty program-something his coaches urged him to do. But as Roger Goodell saw it, Hargrove was guilty of the worst crime of all: lying to Roger Goodell. Yes, Michael Vick was guilty of leading a dogfighting ring. But as a league source explained to Yahoo's Jason Cole in 2007, "Where [Vick] is in the most trouble is that he lied to the commissioner." Smith was suspended in part because of his role as a "defensive leader." Once again, this is a vengeful paternalism masquerading as principle. "I am not aware of previous League discipline that similarly rested on whether or not a player was a team leader," Tagliabue writes, dismantling the Goodelian precept of "you're older and you should have known better." The NFL is claiming today that Tagliabue's decision "underscores the due process afforded players in NFL disciplinary matters." That's a funny gloss on a process that U.S. District Judge Ginger Berrigan, in hearing Vilma's defamation suit against Goodell, described as unfair, saying she "believed that the commissioner overstepped his bounds." To the extent that Vilma, Smith, Fujita, and Hargrove did receive due process, it was in some measure because the league felt threatened by the possibility of having the case heard in a real court rather than its own kangaroo version, one in which real evidentiary rules apply and the judge doesn't also happen to be the jury and the executioner. Vilma's attorney Peter Ginsberg declared today that his client's defamation suit against Goodell will continue. Of all the players, the linebacker's case remains the cloudiest-though Tagliabue says there's strong evidence to suggest Vilma made a speech calling for a bounty to be placed on Brett Favre, he makes a distinction between off-field rhetoric and on-field action, saying "there is no evidence that a player's speech prior to a game was actually a factor causing misconduct on the playing field." This is the kind of shaded analysis that reflects the reality of a sport in which there will never be a clear demarcation between sanctioned and unsanctioned violence. From the earliest stages of the bounty case, though, Roger Goodell has acted as if blurry lines are clear ones. When he first announced the Saints' transgressions, Goodell noted that he was most concerned with "player safety and competitive integrity." But what Paul Tagliabue's ruling reveals, as the Saints look back at the wreckage of their season, is that there's a much bigger threat to the NFL's competitive integrity than a bounty program: It's a commissioner who's out to make examples of people for defying his authority. Josh Levin is Slate's executive editor. You can e-mail him at sportsnut@slate.com, visit his website, and follow him on Twitter.